Panasonic recently released the AJ-PX230PJ AVC ULTRA handheld camcorder, a successor to the company’s AJ-PX270. 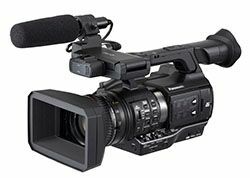 The PX230 camcorder offers 10-bit, 1080p AVC-Intra and AVC-LongG codecs, extensive video control, a 22x zoom and lens and OLED viewfinder. The video recording quality and body design of the camcorder is the same as the PX270. New features include wired and wireless networking, and a proxy and Genlock/TC interface. produce quality pictures. With its AVC-ULTRA codec, the camcorder features a wide range of re-cording modes including 100Mbps AVC-Intra100 and 200 Mbps AVC-Intra200 for high-quality re-cording. To decrease file size, the PX230 has a variety AVC-LongG quality levels options, including AVC-LongG50, AVC-LongG25 and AVC-LongG12. These 10-bit, 4:2:2 sampled codecs (LongG50/25*) record in smaller file sizes to saving storage cost and transfer time. The camcorder also offers legacy recording in DVCPRO HD, DVCPRO50, DVCPRO and DV formats. The camcorder’s compact, 22X zoom lens has a wide 28 mm to tele 616 mm (35mm equivalent) zoom range. The PX230’s three manual operation lens rings — zoom, focus and iris – provide a manual control similar to interchangeable lenses, but does not require actual lens changes. In addition, the camera’s multi-step zoom control provides fast response and smooth zoom ac-tion. The zoom control on the handle enables variable speed zoom, allowing fine zoom control even for low angle shots. The PX230 is equipped with Panasonic’s Chromatic Aberration Compensation (CAC) technology to maximize lens performance and a Dynamic Range Stretch (DRS) function that optimizes scene image contrast at the pixel level to reduce overexposure and improve human skin rendition. A flash band detection and compensation algorithm minimizes partial image exposure due to strobe lighting.